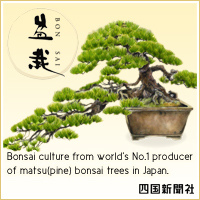 Thank you for visiting our bonsai website. Please feel free to link to this website. We hope to reach visitors from around the world. Copy and paste any of the link sources below. Download any of the images below and embed the following source to your HTML. Please make sure to include the website title, "BONSAI" for the image alt tag. Please do not alter or adapt on the image data. This sample image is smaller than the actual size.